Getting into ketosis, or the state wherein your body consumes fat for energy, can be a difficult task at the start. However, there is something you can do to help the body along, and that’s to add another diet style to your repertoire – intermittent fasting. Intermittent fasting means what it sounds like – cycling between eating and fasting. It’s less a diet and more a way of approaching your meals. There are many ways to approach this, but for the most part, you fast for approximately 16 hours a day twice a week. During those days, you eat during the eight hour remainder, consuming your daily required caloric intake. Combining this with keto keeps your protein and carb intake down while simultaneously encouraging ketosis. The core tenet of losing weight is to simply consume more than you take in. 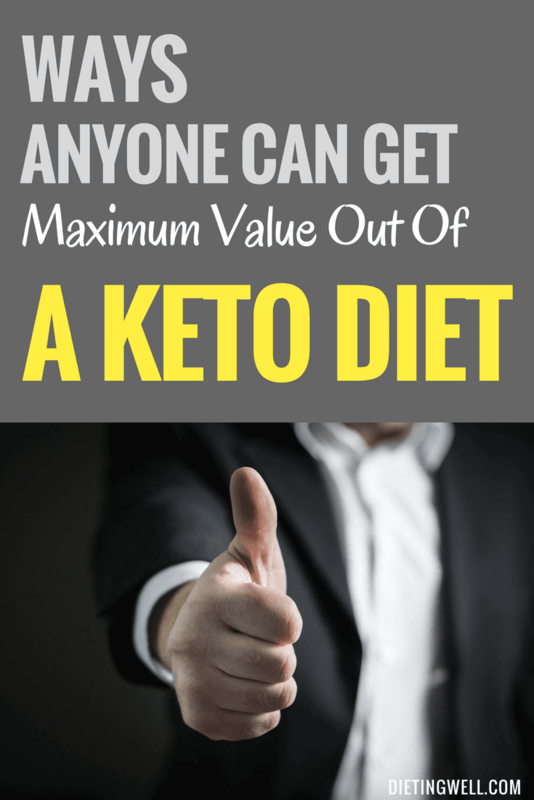 Keto diets help improve this formula by essentially training your body to eat fat for energy rather than sugar, which helps you lose weight and be more energetic in one fell swoop. However, while the diet can do a lot of work, you can help it along by putting in some exercise. Regular exercise doesn’t just help you burn more than you take in, it also activates a molecule called GLUT-4. GLUT-4 uses sugar and turns it into muscle and liver glycogen, leaving your body to focus on consuming fat. The biggest mistake many dieters on keto make is to simply eat too much protein relative to the fat intake. Ketogenic diets only consist of approximately 20-30 percent protein. Eat too much of it, and the diet falls apart. This is the most common reason people fall out of ketosis, and while you can get back into it, it’ll slow down keto’s beneficial effects. It’s common knowledge that a ketogenic diet is inherently low-carb, with the majority of dieters consuming 30 or fewer grams of carbohydrates daily. However, what most may not know is that the quality of the carbs they eat matters as well. Empty carbohydrates might fill your keto metrics, but they won’t help you become healthier. It’s best to focus on consuming carbs high in nutrients, such as low-starch vegetables, to not just lose weight, but to become a stronger and healthier person. When people think about ketogenic diets, they think about bacon, cheese, and low-carb intake. What many might not think about is the oil in their diet. The kind of oil you use to prepare your meals also has a great impact on the diet’s viability. The go-to oil for keto dieters is MCT or medium chain triglyceride oil. It’s easy to digest, and lets you stay in ketosis longer and more easily. MCT oil is also easy to use, and can be added to be everything from coffee to protein shakes. One of the drawbacks of the keto diet is the keto flu. Due to how the body has to adapt to ketosis, it can provoke flu-like symptoms in the dieter. These symptoms can last anywhere between a day to a few weeks. The good news is that these symptoms are manageable. Staying hydrated can prevent the symptoms entirely, or at the very least keep the flu short. Not only will this be more comfortable, it’ll let you continue with other diet-helping acts, like exercise. One of the more common complaints that people have about the keto diet is how it can adversely affect their bowels. When people enter ketosis, they may experience stomach issues, either becoming constipated or the opposite. While it doesn’t happen to everyone, you need to be ready for it just in case. Simply increasing the fiber in your diet should help things clear in many cases. For others, an increase in fermented foods such as kimchi and pickles can help settle the stomach. The good news is if you do end up feeling under the weather, your tummy woes won’t stay for long. Eventually, your body will get used to the adjustment. Making the ketogenic diet work takes more than proper eating habits. It’ll also require you to get the right amount of sleep and rest. If you don’t get enough sleep, your stress levels rise. This can send your blood sugar levels spiking, which limits ketosis immensely. Most people have to keep a careful watch on their salt intake. This is due to how it interacts with a high-carb diet, and the insulin levels that come with it. This leads to sodium retention, and is why people have to keep salt intake low. However, keto dieters do not have that problem. People on keto are will consume far fewer carbohydrates than those who aren’t, by nature, and will need to make up for this by increasing their sodium intake. An additional 3 grams per day is often enough. How you get this extra salt is up to you. You can drink broth throughout the day, use pink salt in your food, or eat some high salt sea vegetables. Stress is the great diet killer. If you’re constantly under stress, your body will find it difficult to both shift into and stay in ketosis. The constant pressure will keep your blood sugar levels elevated, which is contrary to what you want in keto. Find ways to keep yourself calm, such as meditation or limit stress factors. If it’s not possible due to a rough patch, you may need to hold off on the diet until you’re in a better position to suit it. The most important thing you should remember about the ketogenic diet is that it’s only one part of a healthy lifestyle. You can’t just plug it into your life and expect it to work well. It must be one of many changes you’re willing to make to improve your quality of life. It might be difficult, but it’s definitely worth it.